If you are anything like me, you love books. You have them for you, for your husband, for your kids. I have a real love for children's books and young adult fiction. We seriously read so many books and reread them and get sick of them and hide them. It is kind of a trend we follow. That is why I decided I needed a new system for rotating children’s books. Why would I need a new system? Because our house starts looking like….this…..
A few summers ago, I devised a system of rotating my children's books and toys. This has really helped keep our books and toys in good condition. It also helps the kids enjoy their toys and books for longer. Every quarter it is like getting new stuff! And it keeps our little house organized and Mom happy. So how do I go about organizing THIS??? Make book piles. You can see below I organize my piles by seasons, books needing rotated, new books and then board books. Pull out whatever the current season’s books are. And yes, I really do have enough seasonal books for each season. I have an entire bun just for Christmas books and another for Halloween books. It’s a real problem. Fill your Children's Bookcase with these books so you are ready for the current season. Make a book bin or box for each rotating season. Once you have a bin for the season, label it and add your books. Place it in the closet, under a bed or on a shelf. Every quarter rotate out some books and keep others. 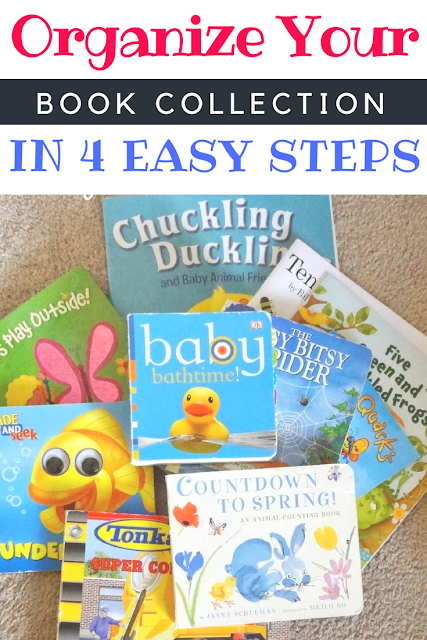 Making sure books are age appropriate and that will keep your child’s interest. 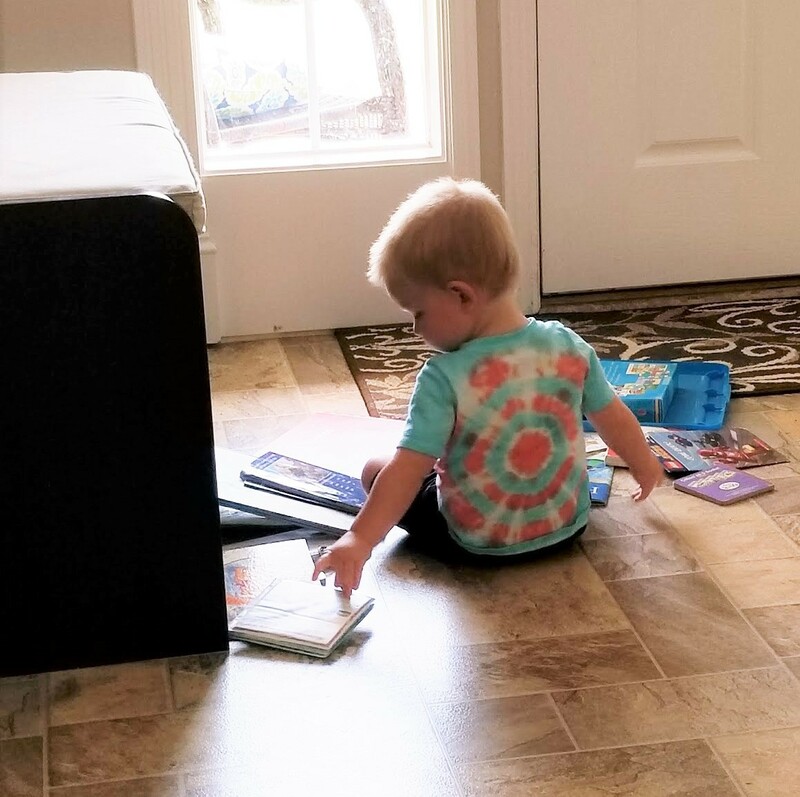 If you don't have fabric storage bins like these that you can use for rotating children’s books, you can make your own with our DIY Fabric Storage Tote Tutorial. Or you can use some old boxes. I do a combination bit of both. I have some great milk boxes from Costco, they are perfect for storing books. Once I have rotated, I put my bins and boxes back in the closet for next quarter. Remember to rotate. This might be the hardest part of rotating children’s books. I have it as one of my quarterly cleaning jobs. You can grab your own cleaning chart for free HERE on our site. If I haven't marked it off, that means I haven't done it. Another way to help you remember is just put a reminder in your google calendar to rotate once a quarter. That way you get a reminder right to your phone or email. 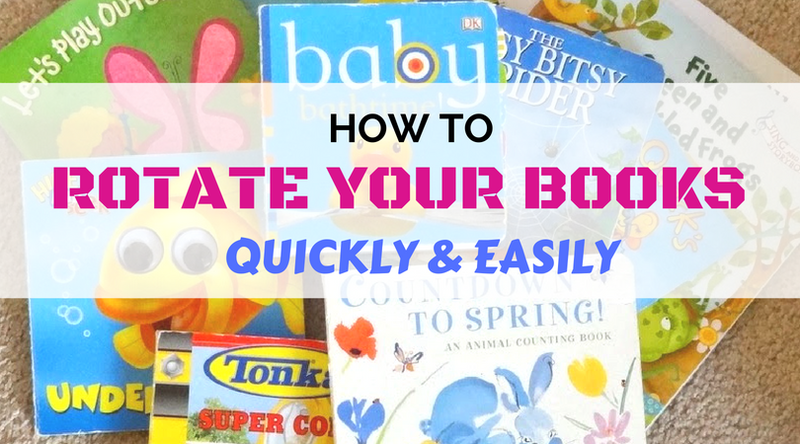 I hope this method of rotating children’s books will help keep your home and family more organized. But I also hope it will lessen the stress of a messy home and too much “stuff”. Make sure to check out this great post about how I rotate my children’s toys too.